Bless this mess....: How will she eat??? Well....Emily and Katie continue to lose their teeth! Last week, Katie lost 2 teeth within 24hours. Sunday, Emily lost her a tooth that makes her have that cute, toothless smile. She has a sweet lisp in her talk before, but now....wow. We make her say things just to hear how she will pronounce them. 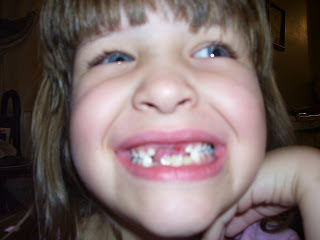 The Tooth Fairy is going to need to take out a home equity loan!!!!! Eric started a new job on Tuesday. He is a loan specialist at Cornerstone Mortgage in Belleville. He is excited to be starting in a new office.